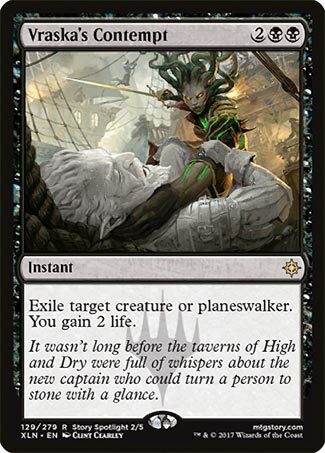 Vraska’s Contempt is one of those cards that’s not very flashy, and doesn’t read very interesting to a lot of decks, but is the kind you’re always happy to have around. If you remember the original Ravnica block (or the Conspiracy draft formats), think of it as the current environment’s equivalent to Mortify. There’s been some online hot air devoted of late to whether or not answers are too expensive, but when you weigh this card’s cost versus its versatility – not to mention the possible devastating effects that planeswalkers can have when unchecked – you might see it as a role player that may not have much effect beyond its intended formats. But we already know that not everything does. We have come a long way since Terror. Doom Blade was a huge improvement and then Hero’s Downfall set the bar again by improving upon Murder. Now we have Vraska’s Contempt. For one more mana you get 2 life but more importantly you get to exile the card. This is important because we are in an age of graveyard shenanigans and God cards. In standard it’s a good solution to the cards Fatal Push can’t deal with but in Modern it is competing with Damnation and Languish on the curve. I remember that Hero’s Downfall in Theros and Dreadbore in Return to Ravnica were early passes of this effect, a targeted way to kill creatures or planeswalkers. For one more mana, you upgrade it to exile and gain 2 life. It’s a flexible removal spell that’s not lacking targets, and I think any black deck would be well-suited with a few copies of this card. Previous articleWhich PC Parts Retain Their Value?